Plasma lighters are on the rise as the latest lighter trend, due to the fact that they’re rechargeable and look pretty damn cool. 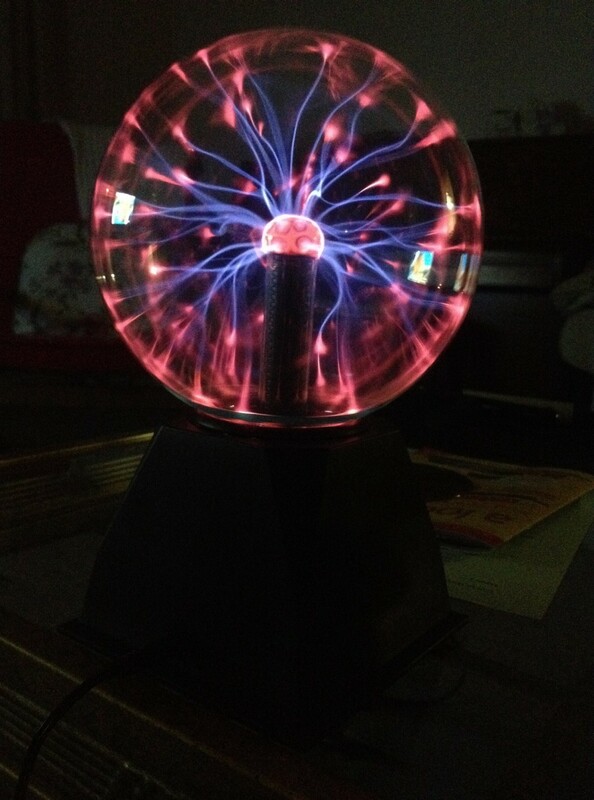 Sadly, I don’t have one of those, but what I did have was a plasma globe, which I think looks even prettier… at least it did, until it broke. The picture you see above was one of the many reasons for my return to London’s Science Museum. After years of playing with my trusty (and quite frankly, awesome) plasma globe, which I bought during my last visit to London, its precious life was cut short by a strong breeze and a high table-top. Naturally, rather than being logical and simply ordering another one online, I thought it would be more fun to return to the science museum to pick one up in person… and play with all the space stuff. First off, let me say that I am not a huge fan of London: I’m a country gal to the bone, and am more used to being surrounded by cows, rather than cars. London is loud and chaotic, and always makes me feel like I need to shower for the next 48 hours after I leave, so the only thing that will get me to go there willingly is the promise of an amazing experience, one that isn’t available in my immediate vicinity. So, when the chance came to head back to the science museum, my inner sci-fi nerd jumped at it. I mean, come on, they have a piece of the moon in there, and God knows that’s probably the closest I’ll ever get to it. After fighting my way through the tube and the humid discomfort that August heat brings to the underground system (as well as chugging half my body weight in Red Bull to combat the early start to my day), I was literally shaking from excitement… or I was having a caffeine overdose. One of my favourite things about British museums is that they are free,* and that’s not just because I’m cheap, but because it doesn’t discriminate against learners of all backgrounds, which I think is brilliant. After a wonderful lunch with the family in the ‘Deep Blue’ restaurant, we went to see the Apollo Moon landing in one of the IMAX theatres, and I was thoroughly surprised when the cinema seats began shaking and moving around in tandem with the film. Exiting the theatre, feeling exhilarated and somewhat disorientated, we had a wander through the Leonardo da Vinci exhibit, where they had brought to life some of the maniacal designs by the late artist in 3D sculptures. We then entered a room that had aeroplanes suspended from the ceiling and steam trains casually scattered about the place. This huge room was filled to the brim with automobiles, some pieces dating back to when the car was invented, and it was interesting to see how something so common in this day and age was once a real luxury. Seeing how the designs and sizes have changed as they years have gone on, to comply with more cars on the roads and ever-improving technology, was also strange. Finally, we arrived at the part of the museum that made my inner nerd weep with joy: the space exhibition. The place is filled wall-to-wall with rockets, space-suits and physics so complicated it would give the average human a headache just looking at it. To see what life was like for the astronauts was fascinating to me; seeing their dried food containers (which still are safe to eat, by the way) and getting an insight into the complexity of living in space was amazing. The museum’s reconstruction of Apollo 11 made me wonder how cramped and uncomfortable it must have been to be trapped in that shuttle for over a week, but also how incredible it must have been to be the first person to make in imprint on the surface of the moon. That is, unless you believe the conspiracy theorists who say it was faked… Personally, I don’t know, but I think it’s pretty cool anyway. My father had told me what it was like to watch the landing on the TV as it happened, and while I felt incredibly jealous, I also felt so much hope for how I myself might witness something just as incredible in my lifetime. With the progression of technology being what it is, I’m still holding out hope that some billionaire-mad-scientist-type will give me the opportunity to see space – come on Richard Branson, get a move on! – but for now, I’ll settle for nerding out in the Science Museum. Oh, and here’s the piece of moon rock: I did ask, but apparently you’re not allowed to chip a bit off to take home. *free to enter and to wander round, IMAX experiences vary in price but aren’t too costly and most are well worth the money.